Dino Melaye has threatened to sue the Inspector General of Police, Ibrahim Idris over the reported escape of two suspects who accused him (Melaye) of being their sponsor and gun supplier. Melaye who spoke on the floor of the Senate on Wednesday, claimed that the police had either released the suspects or killed them. He therefore said that the Police must produce the suspects dead or alive or he would sue the Police IG for intimidation, abuse of power, harrasment and mental assault. 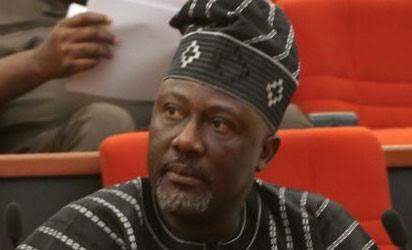 On March 20, the Nigerian Police paraded the suspects allegedly working for Melaye. The thugs were caught with two AK-47 and five pump action guns. The suspects were billed to be arraigned on Wednesday. However, in a dramatic turn of events, the Police in Lokoja announced on Wednesday that the supects along with four others escaped following a jail break. The Kogi State Commissioner of Police, Mr Ali Janga said at a press conference in Lokoja that the two suspects; Kabiru Seidu alias Osama and Nuhu Salisu alias Small escaped at about 3:21 am at the A Police Division in Lokoja where they were being kept in lawful custody. According to the Commissioner, four other suspects escaped along with Seidu and Salisu, bringing the total number of fleeing suspects to six. Both Seidu and Salisu escaped in the early hours of Wednesday, a day they were supposed to be arraigned before a Lokoja Federal high court alongside Melaye and Mr Mohammed Audu who was also named by the suspects as their sponsor. The four other suspects that escaped include Aliyu Isa, Adams Suleiman, Emmanuel Audu and Musa Mohammed. NAN reports that the police Commissioner said that 13 policemen, comprising five operatives of Special Anti-Robbery Squad (SARS) and eight conventional policemen on duty when the incident happened have been detained for interrogation. “The 13 police officers who were on duty when the incident occurred were defaulted and detained for interrogation,” he said. Janga also stated that the names of the six fleeing suspects and that of Dino Melaye and Mohammed Audu had been sent for watch listing by the Interpol for immediate arrest anywhere they are found. The police enjoined members of the public to go about their lawful duty as the command was in full control of the situation and determined to provide adequate security.